MormonInfo.org - False Prophecies - Why didn't Jesus come back by 1891 as Smith said in the History of the Church 2:182? President Smith then stated that the meeting had been called, because God had commanded it; and it was made known to him by vision and by the Holy Spirit. He then gave a relation of some of the circumstances attending while journeying to Zion—our trials, sufferings; and said God had not designed all this for nothing, but He had it in remembrance yet; and it was the will of God that those who went to Zion, with a determination to lay down their lives, if necessary, should be ordained to the ministry, and go forth to prune the vineyard for the last time, or the coming of the Lord, which was nigh—even fifty-six years should wind up the scene (History of the Church 2:182). Fifty-six years came in 1891, and obviously the Lord did not come. Certainly, it is easy enough to grant that prophets are not infallible human beings, and that only when such individuals claim to speak in the name of the Lord are they acting as prophets. (Although it should be noted, by the way, that the late Prophet Ezra Taft Benson denied that a prophet must say "thus saith the Lord" before he gives us scripture--Teachings of Ezra Taft Benson, 136.) If we asked a prophet who he likes to win in tonight's basketball game, for example, we need not write him off as a charlatan if he calls it wrong. He may not always claim to be speaking in the name of the Lord, or as Smith said, functioning as a prophet. But if a prophet tells us that he has seen the Lord and because of that experience the Jazz should win the game tonight, and the Jazz end up losing, then we would have prime facia good reason not to believe this individual is a prophet is of the Lord. Smith was, if we indeed have a faithful record in the History of the Church, playing the God card in this particular situation--God commanded, God designed, God remembered, and God willed. Supposedly, Smith was either speaking in the name of the Lord or he was taking God's name in vain. If the former, then it is on this basis that we "should" have expected fifty-six years to have been enough time. Though the term "should" indicates an opinion, keep in mind that not all opinions are equal. Contrast the opinion that a family should have pizzas on Fridays with the opinion that a family should have a family home evening every week. The former is simply a matter of personal preference, whereas the latter is based on other items of knowledge of what might be beneficial. Certainly if the goal is to produce what is beneficial to the family, the latter may be exemplified in various ways… camping trips, a once a month family home evening, etc. If a prophet obtains knowledge directly from the Lord for something as obvious as spending time with one's family is beneficial, a family home evening every week should follow from this. The term "should" can be used here as opposed to "would," since other considerations may rule the practice out (e.g., other later divinely sanctioned work schedules that would preclude it). So there may in fact be other factors to consider that would override the prime facia evidence that fifty-six years should be enough time. For example, perhaps the Lord would grant mercy and extend the time as He did for the Ninevites when Jonah just gave them forty days to repent. We can rightly say, "Forty days and they 'should' have been toast!" Of course some may claim that it is important to look at how Smith was understood by his immediate hearers and others in the early LDS Church. While this may shed some light, the problem with this is that even Scripture may be distorted through one’s filters. This is especially the case with Scripture that is difficult to understand (cf. 2 Peter 3:16). Thus, my own conclusion is that this is not a clear case of a false prophecy against Smith... in and of itself. However, in conjunction with other prophecies Smith said, it makes sense that he was giving false prophecy concerning the return of Christ. by the authority of Jesus Christ, that not many years shall pass away before the United States shall present such a scene of bloodshed as has not a parallel in the history of our nation; pestilence, hail, famine, and earthquake will sweep the wicked off this generation from off the face of the Land, to open and prepare the way for the return of the lost tribes of Israel from the north country. 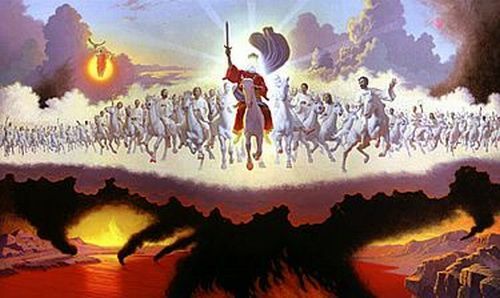 The people of the Lord, those who have complied with the requirements of the new covenant, have already commenced gathering together to Zion, which is in the state of Missouri; therefore I declare unto you the warning which the Lord has commanded to declare unto this generation... therefore, 'Fear God, and give glory to Him, for the hour of His judgment is come.' Repent ye, repent ye, and embrace the everlasting covenant, and flee to Zion, before the overflowing scourge overtake you, for there are those now living upon the earth whose eyes shall not be closed in death until they see all these things, which I have spoken, fulfilled" (History of the Church 1:315). This gathering to Zion was in connection with the prophecy about 4 months earlier concerning the building of the house of the Lord, which was to be reared in that generation but never happened (cf. Why wasn't the Missouri temple ever built in Joseph Smith's generation? (D&C 84:1-5)). That generation is gone; none are still living today. Finally, this 1835 prophecy fits with what Smith prophesied in 1843. D&C 130:14-15 says, "I was once praying very earnestly to know the time of the coming of the Son of Man, when I heard a voice repeat the following: Joseph, my son, if thou livest until thou art eighty-five years old, thou shalt see the face of the Son of Man. Smith was born the end of 1805, so that would put it around the 1891 period. So again, the Lord should have returned in 1891 if Smith was true prophet of God.